Clancy wins 1st place at the 2014 Maryland DogFest talent show… that’s two years in a row! Here he is holding a gift bag with his 1st Place certificate next to two of his famous trick props. We had Rally Obedience run-thrus in the morning, so I wasn’t sure what Clancy had left in the tank for his talent show performance here. I also have been so busy, that I didn’t figure out what I was going to do until 5 minutes before the show. There were many dogs in the contest and Clancy and I were called up last. After watching other competitors, I decided not to duplicate the other dog’s tricks (I didn’t want Clancy to entirely steal the show 😉 ). Though Clancy has many more tricks up his sleeve, we’ll save them to share with everyone another day. (I also had a time limit to try to stay within at the talent show.) Next time we do a routine, we will be more polished and show off even more tricks! P.S.S. I do plan on writing a dog tricks blog in the near future, too! Trick training is a great way to have fun, strengthen your bond and challenge your dog! P.S.S.S. I am just starting up a pet services business where I also offer dog trick training! Visit www.FUNanimalPet.com to learn more about it! 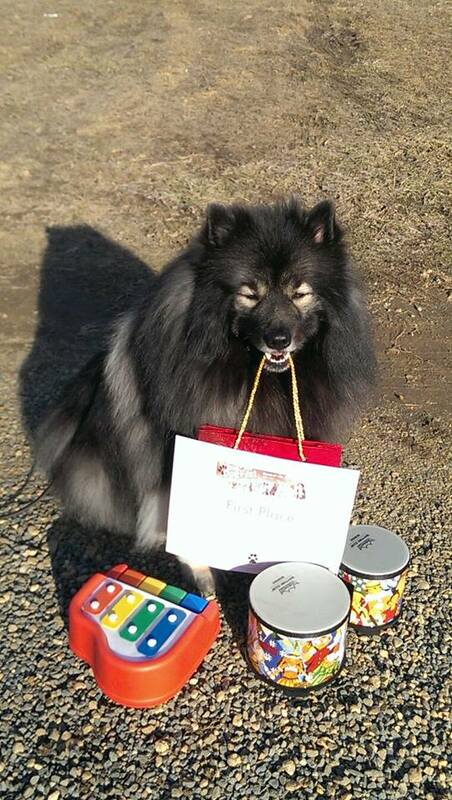 Categories Clancy ~ My Keeshond, Uncategorized, Videos starring Clancy the Keeshond!